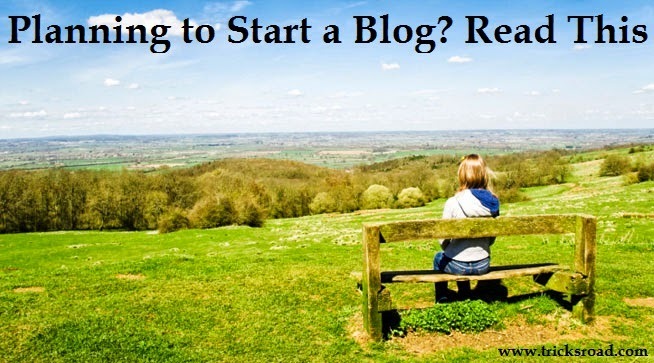 So you want to start your own new blog? Or you want to take your blog to a new height? This post is for you. Here I’ll discuss about few important things to know before starting a blog. If you’re in this field you must have seen things about blogging changes every now and then but not completely. This I think is the beauty of blogging. You must have to be active in the blogosphere and on the internet to keep yourself updated. There are millions of blogs online, but whether all are successful? Of course not. Only few of those make the name and money. Why like this? There must be some reason behind this success. If you can get those secrets and can implement on your blog too, you can be the next. In this post I’m going to show you some important things you need to know before starting a blog. I am sure if you’ll follow these tips, you’re going to save lots of time and energy. I think these are the very basic question you should ask yourself before starting a blog or even if you’ve a running blog, you should ask these questions to plan out the things in a better way. Do let me know your answers of any favorite question in comments. I’ll love to know that. So let’s start with those points by following which you can become one of the successful blogger in the coming time. Also if you disagree with me at any point of time or you want to ask any question/doubt, please drop your question/feedback below. I’ll love to answer those. This is the very first and basic step while starting a blog. Niche selection is very important as this is going to decide your future as how other things will go. It’s always preferable to select single topic niche compared to multi topic niche especially in long race. Already I’ve written a complete blog post on Single Topic Blog vs. Multi Topic Blog. If you’ve not read this, I would suggest you to read that also because I have given a complete guide for the niche here. Also if still you’ve lots of topic in your mind and you’re not sure (my case was similar), this is what you should do and the same I did. Take a pen and notepad and write the entire niche name on which you want to start a blog. Now write at least 15-20 blog post name for each of the niche. You will clearly come to 4-5 from the list. Now check out of the remaining, which have less competition and more chance to earn, select that niche. I am sure by this way you’ll select the best niche for you. We think about this a lot but the best thing you can do about blog hosting is host your blog on your own hosting. No matter it is a blogger or wordpress. Self-hosted blogs are far better than the free platforms like wordpress.com or blogspot.com or Tumblr. So, if you’re going to start a blog I would recommend you to use BlueHost hosting. This is one of the most reliable hosting I’ve ever seen. I’m using their service on my other blog and am completely satisfied with their service. You’ll get a free domain also with any hosting package. With self-hosted blog you’ll be able to manage as per your need which is almost not possible in free blogging platform. This is the point where many newbie bloggers commit mistake. They either failed to define their target audiences or if they do, many fail to reach out to them. You need to overcome on both the scenario. This means select your customers from your niche. This is so simple. If anybody wants to sell a cloth, he/she needs to reach out to that person who are looking for the cloths not there who are looking for something else which does not even have any relevance with cloths. In blogging also we do follow the same things. If anybody/group is looking for the technical tips but you provide health related tips and you’re reaching out to them definitely you’ll never convert those to buy from you or visit to you. So always select your target audience. If you’re blogging in health related domain, join those groups where people are looking for health related tips, advertise on that place where these people come. You’ll definitely rock. Always serve only those things which people need!! There are plenty of websites and blogs in the world and around a million are getting registered each month. So in this competitive world you need to be unique through which people can easily remember you. If you’re starting a blog for the short term like event blogs, you can have keywords in the domain name else select some name which readers can easily remember. No Sms words like u for you, 4 for for etc. You can check my details post on How to select best domain name. Most of the bloggers especially the newbies focus on visitors and try to get more and more visits to get good income from AdSense, you should initially avoid this. I am not telling you that you should not focus on traffic. You do but focus on the contents more. Focus on readers rather to have more page views. Write engaging contents and that content which solve other’s problem. If you’re able to do so, traffic will automatically come. And then you would be easily able to convert your visitors into loyal readers. Initially I too had this misconception that I’ll get the traffic from Google and other search engines but within few weeks I realized it’s almost impossible to get decent traffic initially. This is the truth. Nobody can get lots of traffic at the initial days and hence you need to use some other strategies. So, how do you get traffic in the short run? You can get through social media. There are many social networking sites to boost traffic and you should work on those sites to get visitors. Join Facebook, Google+, Twitter, Reedit and others to get good amount of traffic. You can read our post, Top 5 Social Networking Sites to Boost Traffic. Also if you’re willing to spend few dollars you can buy ads on facebook, stumble upon or on other social sites, but if you don’t; you have to make good social media profile. Once you’ve good profile, you can easily get the traffic. Neat & clean design will lead you to success. Initially when I started TricksRoad; I had a basic design which was ok. I continued it for a month and later felt that in this competitive environment where around a millions of new sites are getting started each month, ok will not work. You’ve to be the best and then finally came with this, which is good. Isn’t it? You should have a design which can make money for you. You need one which can drive traffic to your site and hence can lead to money. 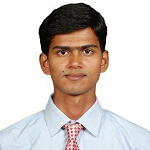 You can refer my details post on How to select effective templates for blogs and websites. Long content has always been a key of success and will be. Google or any other search engines still value a lot for the lengthy articles over the short articles. 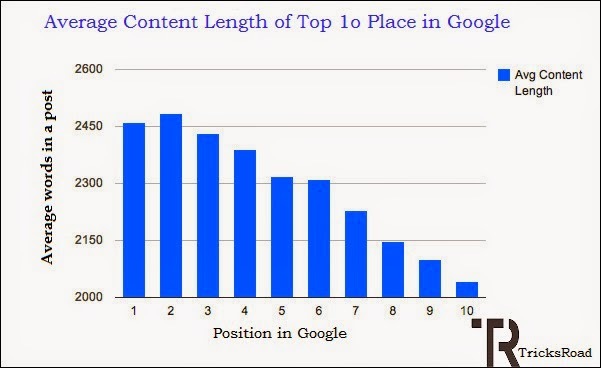 Google has recently launched an in depth article section on their search result.Also the best online marketing person in the world Neil Patel says the more the content length is the more attention you get. You can check his in depth analysis on content length here. I haven’t seen a small article went viral. Always you’ll find those articles which are at least 1200 or more viral on the internet. This is not just for the sake of length. This says while writing the post, a well research has been done and so can solve the problem in a better way. So, you should also be ready to write the long articles if you want to get visible in search engines. You can see in the above figure, all those posts those are in top 10 are of length more than 2000 words. It has been seen that Google prefer personal branding more. You can get this idea from their social site Google+ where they focus more on the personal branding of author. So this is the time to show person behind the great content, site and business. In fact this helps a lot. If you show your picture on the blogs, your visitor gets an idea about your personality and this helps a lot in the interaction. You should spend equal time in building the site and building your personal brand too. If you’re only focusing on building and branding of your blog and site, no doubt people will have a good image about your blog and they will visit you often. But this will not help you a lot. Now suppose you’re starting a new site, you’ve to work again from scratch to make it famous. But if from the start of first blog itself, you’re working on personal branding as well you won’t have to work that much and your name and image will be enough for your readers to visit to your new venture. Neil Patel, Dino Dogan and Harsh Agarwal are the live example of this. So it’s the time to show your face if till now you haven’t. I’ve seen many bloggers using the name as Admin, what exactly this mean. This clearly shows either you’re not willing to come outside or you’re not sure about the thing you do. And if you’re not sure how can others. Believe me you’ll get lot of benefits of personal branding. Also, try to keep same pic everywhere starting from your blog to social sites. I agree this is bit difficult but this will help to identify you by your visitors and will add an extra point in your branding. Last but most important point while planning to start a blog. Ultimately you want to make blogging as your career and want a full time income from this. So you need to plan everything pretty well. Like choose only that niche from where you can earn money else later you’ll find bit difficult to earn. Be sure about the monetization techniques that you’re going to use in near future to earn from your blog. You can check my article on different ways to make money from your blog. Here I have listed around 19 real and proven methods to earn from blog. Planning is very important before starting anything in life. This doesn’t end to blogging. If you’ve planned everything well, you will get success. And I’m sure with these points you can break the barrier. So that’s about things to know before starting a blog. If you liked this post, please consider it for sharing. Also to receive such tips directly in your email, subscribe us. It’s just a click away. So what other things we need to know before starting a blog? Please comment. 13 comments to ''10 Things to Know before Starting a Blog"
OMG another interesting post. Will come back tomorrow to leave a insightful comment. I'll wait for your feedback bro !! This is a well planned and a helpful post. 2. What is your ultimate goal I just want some fame online and offline. As I aspire to be some kind of developer either software or website or Application. I still need to figure it out. I agree with all the points stated by you. The most important point I thought was being social. If you are not social there are chances you cannot achieve your main goals. So yeah, being Social is Important. I've been blogging since past 4 years and in my blogging career I've come across with many new bloggers. The common thing I've noticed in many of them that they left blogging very early, mostly in 6-8 months. Blogging has a learning curve and one can learn with experience. I think the 4 point "Can you commit to Blogging- Consistency" should be the 1st for new bloggers. If someone can be consistent, he is welcome to blogging. Thanks for stopping by. I agree to you that many bloggers leave blogging in the initial days. This mainly happens due to lack of dedication and knowledge. If one really wants to do well they should be well prepared with it. Regarding the consistency, I agree that this is very important and just to mention bro, i have randomly written this and i think all the points are equally important. Thanks for your valuable comment and Have a great year Ahead !! Your 10 points for starting a new blog are awesome, just like any other business offline and online, you must be prepared mentally and resourcefully before initiating a business, unfortunately many came into blogging just to play and express themselves yet they want to make good money from blogging. Gone are the days anyone can just start a blog anyhow and succeed with it, the competition is so high these days so your points if well understood will go a long way in helping a newbie in starting a blog that thrives. Thanks Emebu. First of all welcome to TricksRoad and yes just like any other business, Blogging also need good planning and implementation. And once you're done with it, success will be yours. Thanks for sharing your views. Keep visiting !! Your all points are awesome and your explanation fantastic. Thank you much bro.. for this awesome post. Ashutosh, I started my blog, when my son was born. I wanted to lay down my emotions for him somewhere, so that i could myself cherish those moments at a later point in time. This is how i started blogging. My initial blogs if you would see are only about my son and my emotions for him.Someday, he would read those and would know that his dad loved him more than anyone else. This post is so informative and you have listed good questions and great points that one should think about before starting a blog. Looking at the questions, I am drawn to No 3, 7 and 8. Have a niche story is important as your niche will make your blogging so consistent. I think measuring your time online is an important process. I find out that being online can sometimes be overwhelming especially when you have a busy schedule. Balance is the key and to achieve this goal isn't so easy. If you can't take criticism and pressure, then you need to stay out of blogging. Critics make blogging fun. The points on what you need to know to blog are spot on. Thanks for sharing. This is first time I visited on your blog. First of all I want to say, you have a great customized theme. It automatically attract any reader to your blog. Thanks for sharing these point because these all point must be clear before you start a blog. The most important thing is your personal branding. You must have a good relationship and reputation among your niche community. And the second thing you should be social. You must have a great social presence. You have a lot time to stay online. You have describe each and every point more than expectations. thank u soo much bro for this article .this will more helpful for me .